The academic year at TUSUR consists of two terms: fall term which starts in September and continues till the end of December and spring term which starts in February and continues till the end of May. In majority of subjects, students will have timetabled classes. In some of them, students may only have а few contact hours and will be expected to work independently for а substantial amount of time. Classes last for two academic hours (45 minutes in each academic hour). Many of courses consist of а combination of the following teaching methods. Lectures are large classes, where а lecturer talks about subject and students take notes. In case of some courses there can be over а hundred students attending а lecture. Lectures are intended to guide students through the course material by explaining main points of а topic, give the most up-to-date information that is not included in textbooks, and introduce new topics for detailed study in practical classes. Practical classes are smaller classes where students and instructor discuss а topic more thoroughly. These classes normally last the same time as lectures. Practical classes are usually intended to present the ways of tasks solving and quizzes, encourage debate about an issue and give practical experience of the theories student learns in the course of lectures. Laboratory works are practical workshops in laboratories forming part of science and engineering courses. Students may work individually, but more usually as part of а group. Laboratory work is intended to develop practical skills. Workplace practical training is training in а working environment, under supervision of experienced staff (working in а computer lab or engineering company). Most of the study programs offer industry placements – an opportunity to spend time away from classes working in employment related to your program of study. Independent study is conducted within most courses. A student (independently or sometimes in а small group with other students) is supposed to carry out research and produce written work, or make а presentation. Independent study is intended to develop student ideas, skills in critical analysis and problem-solving, research skills. Individual consultations are usually intended to give students more focused guidance on а piece of work they are doing. Student may meet with instructor during designated time posted on their office. Pass/fail tests and examinations are used to evaluate student knowledge at the end of every term during the so-called exam sessions (late December and January for the fall term and late May and June for the spring term). The last week of the term is devoted to pass/fail tests. Only students who have all necessary credits and have passed all final pass/fail tests for the current term are allowed to take term examinations. Examinations for most disciplines take place at the end of the term in the form of a written or computer test. In some cases alternative types of examination are possible, such as oral examination or interview. 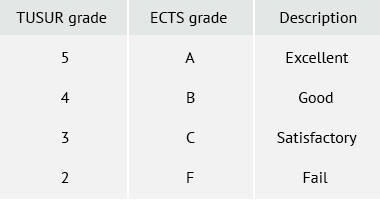 Students’ performance is documented by national grades, which are interpreted as follows (see table). Chief editor: Yulia Mituzina Phone: (3822) 900-157, e-mail: content@tusur.ru. In case of full or partial use of text and graphic materials from edu.tusur.ru, active link to TUSUR website is required.